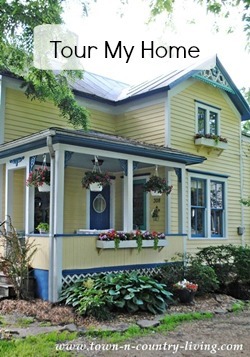 For over a year, hubby and I have been toying with the idea of selling our house. I thought we were going to put it on the market this March, but now I have cold feet. And now I’m wondering what we could do with our existing home to make us stay … like the “Love It or List It Show” on HGTV. 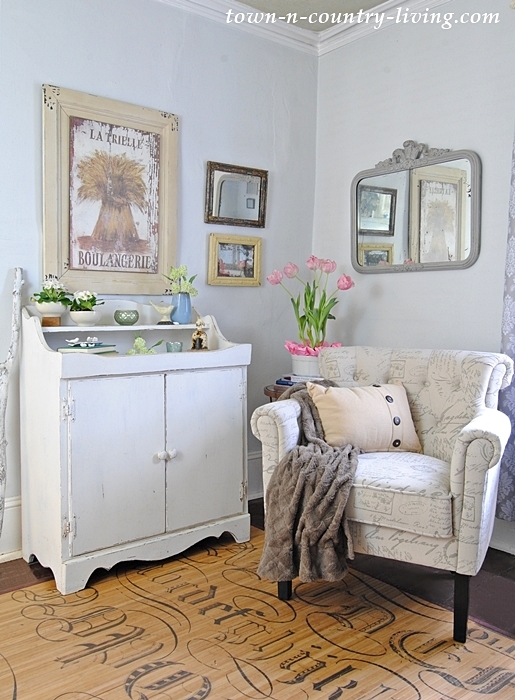 These thoughts and emotions got me to thinking this weekend and inspired me to create a new farmhouse sitting room. If you read my blog regularly, you know that I recently scored these adorable script chairs. I decided they needed their own room, something cozy and conducive to curling up with a good novel. The room below used to be my dining room. We use the dining room just a few times a year. Although the sides of the table lift up to seat more people, it’s quite cozy squeezing 10 to 12 people in this space for a holiday dinner. And our family is only going to keep growing, so this space will no longer work for holiday gatherings. The dining table now resides in another room (more on that in a future post) and my script chairs find their home here in my new farmhouse sitting room. I’m leaving the dry sink in this space for now. I’m either going to paint it a new color, or I’ll replace it with something else. The corner dining hutch stays in this room for now. There’s really no other place to put it. We don’t have a lot of wide corners in our home to accommodate it, due to the placement of doorways and windows. I spent just a nominal amount of money in this “new” farmhouse sitting room. The curtains are new, but inexpensive. I found them for just under $13 for the two panels. I purchased two sets; the others hang on the living room windows. 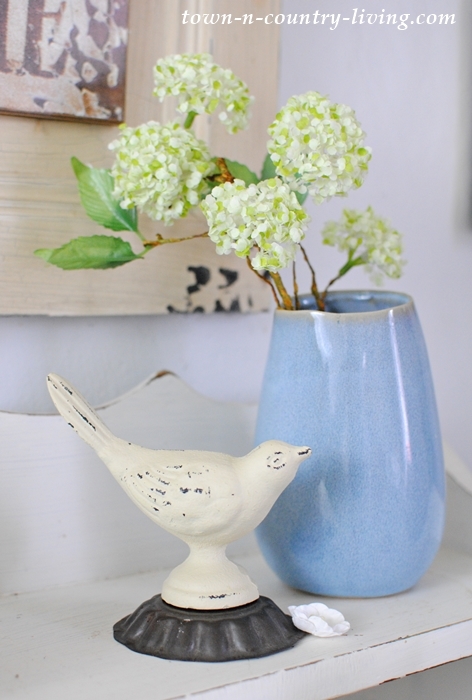 The other new item in this space is a little blue vase I found at Cocoon, my favorite store in Geneva. 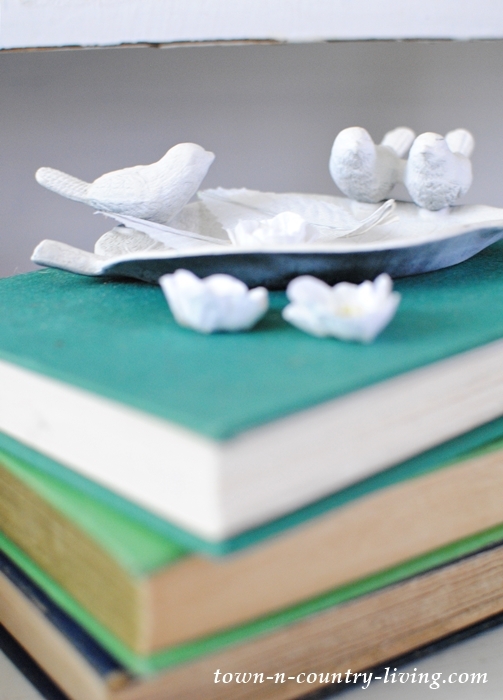 Also on display in the dry sink is a white iron dish with little birds, perched on a stack of vintage books. Our dining buffet with its pretty mirror used to be on the opposite side of the room from the window. It joined the dining table in the adjacent room. Hubby had a genius idea for the mirror resting atop the buffet. He suggested hanging it above the doorway. I love it here; it mimics a transom window and creates architectural interest. We also moved the mantel into the new farmhouse sitting room, but I’ll talk about that later this week. I always get a little nervous moving furniture around. It’s a lot of work and if you don’t like it, you have to move everything back. Right now I’m happy we made this switch. It’s a much better use of space and solved the problem of a cramped dining room, which I’ll share soon. Do you ever get nervous moving furniture around your house? You did a great job setting up your new sitting room. It is a big decision to dismantle a room and change its functional purpose. That takes some courage. It looks so welcoming now. I just rearranged my living/dining room open space about a week ago. I was a little nervous and hoped it would work out better. Luckily it has and I like the new arrangement a lot better. I didn’t ask my husband for help because I seem to move things a lot. So moving large rugs on my own was the worst but I was proud when I finished. I LOVE your new sitting room! I really like all the mirrors above the buffet – especially all the different colored frames. 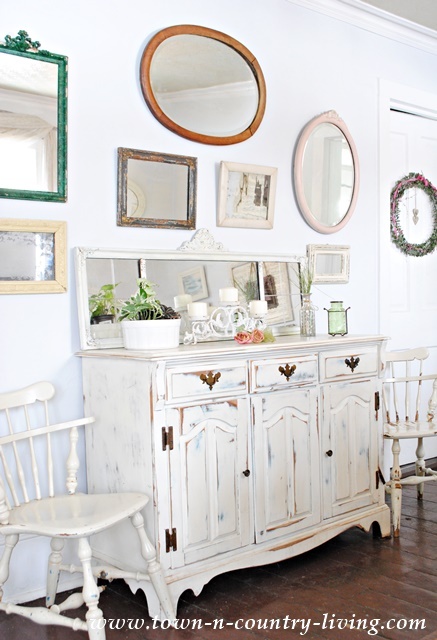 As far as the mirror sitting or hanging above the doorway – if it normally sits on the buffet – move it for awhile. I like it both places. I’m searching for something to go above my dining room doors. I have a sister who should put rollers on her furniture! Every time I go to her house she has rearranged her furniture! I think I told you earlier that I didn’t think I could leave this house if it was mine. ???? Just weigh all the pros and cons. I love your sitting room. I love your new sitting room, and the chairs look perfect with the window between them and the new drapes. 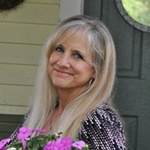 Yes, I get nervous about moving furniture, mostly because the majority of it is very heavy and it’s the least favorite activity of my husband, who is more than happy to just let things stay where they are for 20 years! 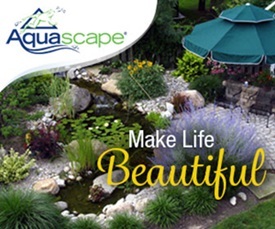 Your home is Beautiful,Thank you for sharing.i also love looking at all the other pictures. Your room came together beautifully. I love the new drapes. So thrifty! Your new vase is lovely. Now all you need to do is add a few hearts and come over at link at The Fabulous Valentines Party! I’d love for you to come and link your Valentines post! Thanks for sharing your lovely room! 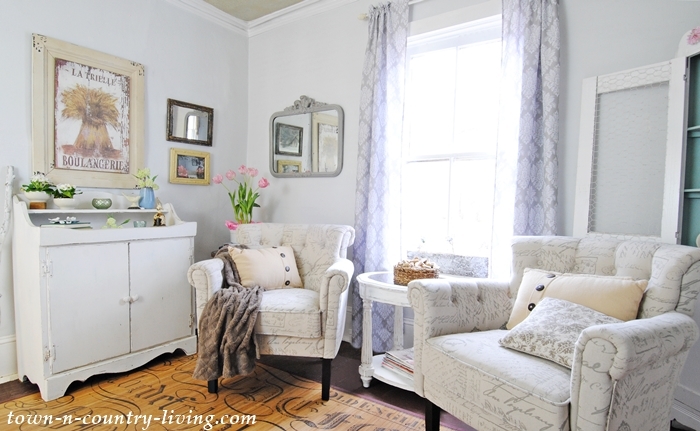 Love your sitting room! 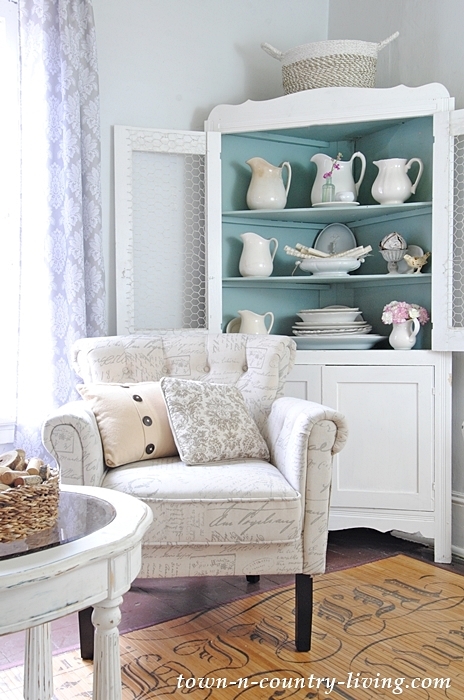 The corner dining hutch could be dressed up in lots of ways with different themes. You hubby is a clever man with a good design sense. The mirror above the doorway is perfect. I like it. Just an idea: think I would replace some of the dishes in the corner cabinet with some books or other things that are less dining room-ish and replace the rug with something softer. 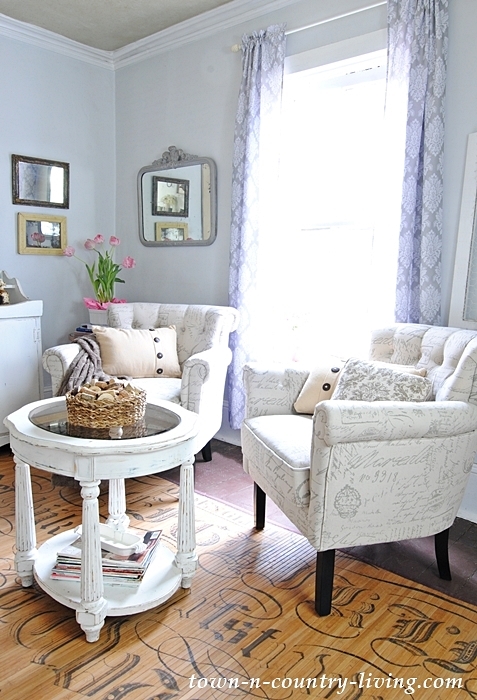 Love those chairs and the new look for this room! I love your new sitting room. Beautiful colors. I like the mirror on the buffet! It is so lovely it would work any place. Do you know the history of the mirror? Wish I had one! I love the change from dining room to sitting room. I agree with Linda and would create softness with a different rug and something other than dishes in the corner cabinet. I really like the corner cabinet in the room (it adds some heft and some height) but the dry sink, not so much. I have a dry sink that I keep trying to incorporate into my “great room” but never seem to have much luck being satisfied with it, so I’m still working on that one also. 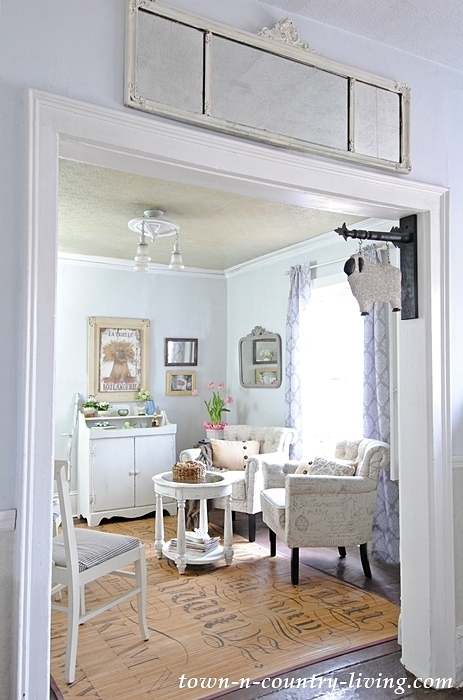 I also agree that the mirror above the doorway is an inspiration – way to go husband! I’m sure after living with the changes for a while, you’ll find just the combination that suits your lifestyle. I’m a regular follower of your blog and have commented more than once that I’m in love with your unusual green tiled kitchen floor and love it when you feature your kitchen. 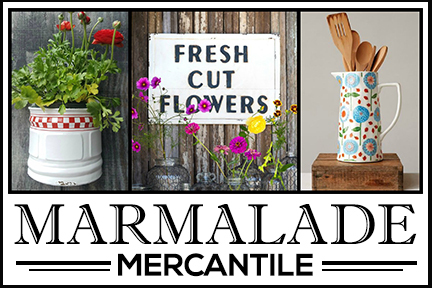 I grew up in the country and your kitchen is a TRUE farmhouse kitchen. Love this room and love those chairs! I especially like the airiness (is that a word) about the room, perfect place to curl up and read in the natural sunlight streaming in. Well done! Love the changes………I agree, softer rug to add warmth, and books in the cupboard…….large books stacked on the floor…..how about the ‘all important’ Reading Lamp….?? Foot stool?? Husband’s idea was brilliant!!! Love the changes!!! I agree, softer rug for warmth, books in the cupboard, how about a foot stool, and the all important ‘Reading Lamp’ ??? Books stacked on the floor. Hubby’s idea was the best!!! I love your decorating style, I think your sitting room is gorgeous. 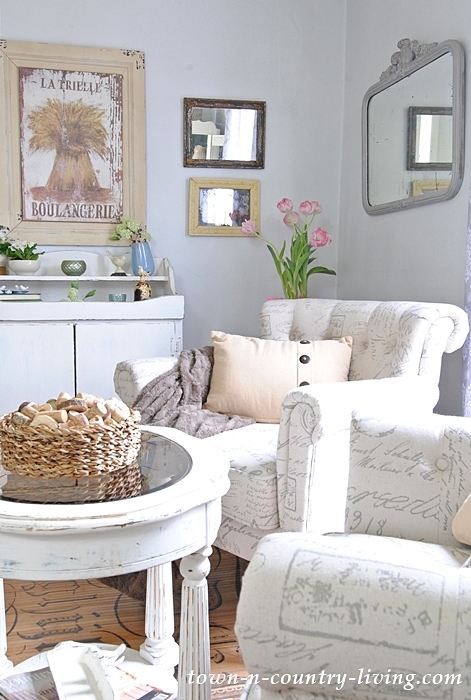 I love everything in the sitting room! The chairs are lovely, the dry sink and corner hutch are beautiful, just my style, not to mention the great spot for that awesome mirror over the doorway. P.S. I love your home. No. I’ve been,moving furniture since I was about 10 and until I moved to a small rental 4 yrs. ago, I moved my furniture and switched rooms about every other month. This room looks fresh and serene and relaxing. 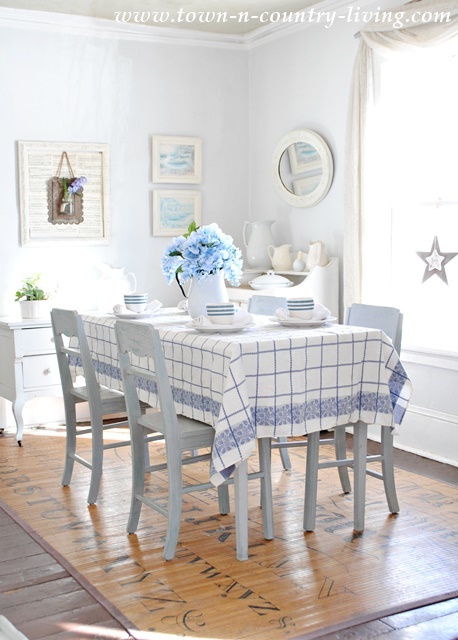 I like the farmhouse/country details and little touches throughout the room. Very nice! Wow! Gorgeous. I love how light and airy it is and your attention to detail is beautiful.